Dynamite Entertainment is proud to announce that Cassie, the star of Tim Seeley’s most famous creation, Hack/Slash, will be crossing-over with Ash from the Army of Darkness, in a new series written by Hack/Slash creator Tim Seeley! Featuring covers by Tim Seeley himself, his Hack/Slash co-creator Stefano Casello, the acclaimed Ben Templesmith, and a special cover by Chris Eliopolis, Army of Darkness Vs. Hack/Slash #1 is not to be missed when it arrives in-stores and digitally this July 2013! 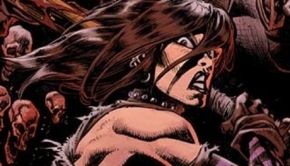 In Army of Darkness Vs. Hack/Slash #1, after the events of the Hack/Slash series, Cassie Hack is doing her best to live a normal life when a Deadite attack forces Cassie back into action. But she’s not alone! Meet Cassie’s new partner: Ashley J. Williams! Can the pair keep from killing each other long enough to quest for the stolen pages from the Book of the Dead? Will Ash get some sugar? Or will Cassie make him kiss it? It’s the horror mash-up that fans demanded! 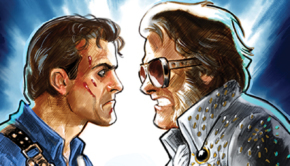 Ash, the square-jawed protagonist of the Army of Darkness series, has frequently teamed-up with (or faced off against) beloved characters from throughout comics, film, literature, and real life. 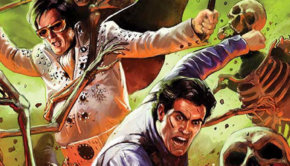 Best-selling crossover miniseries include Marvel Zombies Vs. Army of Darkness, Danger Girl and the Army of Darkness, Prophecy (alongside heroines like Vampirella and Red Sonja), and Freddy Vs. Jason Vs. Ash. Also, in over nine years of publication through Dynamite, the Army of Darkness series itself has hosted Darkman, H.P. Lovecraft’s mad scientist Herbert West, and classic monsters like Dracula and Frankenstein. Ash even got patriotic when he met the president in the Ash Saves Obama storyline. 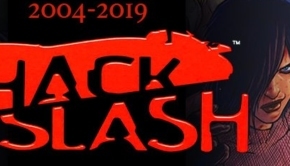 Hack/Slash is a comic books series, created by writer/penciler Tim Seeley. The focus of the series is on a horror victim, Cassie, who strikes back at the monsters, known as “slashers”, with Vlad, a disfigured “gentle giant” who frequently wears a gas mask.